The All India CPI_IW for June, 2017 increased by two points and pegged at 280. The official Press Release has been released by the Labour Bureau today on its official portal, the index has increased by one point and stands at 278. Expected Dearness Allowance and Dearness Relief for Central Government Employees and Pensioners is almost decided to hike by 1 percent with effect from 1st July 2017. The total DA and DR from 1.7.2017 may be revised as 5%. Consumer Price Index for Industrial Workers (CPI-IW) for the month of April 2017. One of the important statistical index of CPI-IW for the calculation purpose of Dearness Allowance and Dearness Relief for the existing and retired employees of Central Government has been released by the Labour Bureau today on its portal. The All-India CPI-IW for January 2017 increased by two point and stood at 277. 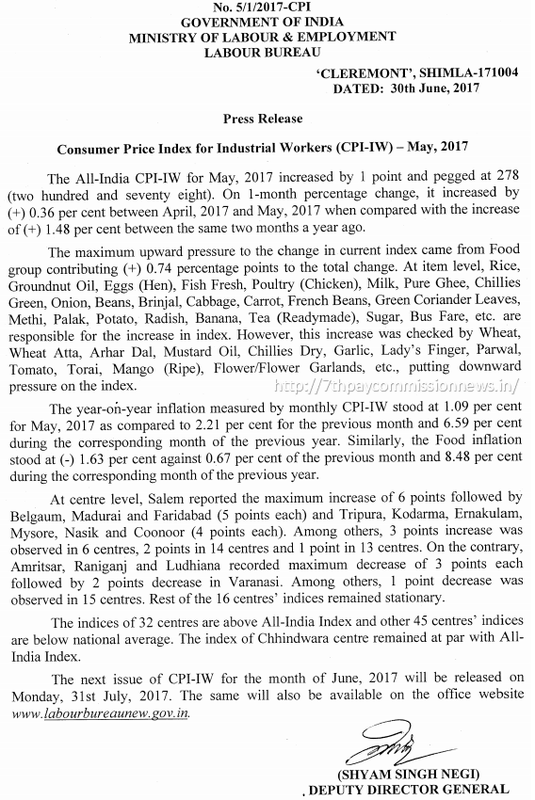 The CPI-IW for the month of May 2017 will be released on 30th June, 2017. All India Consumer Price Index for Industrial Workers (BY 2001=100) for the month of February 2017 released by the Labour Bureau today. The All-India CPI-IW for January 2017 remained stationary at 274 (Two hundred and Seventy four). The Labour Bureau today published the magix number of AICPIN for the calculation purpose of Dearness Allowance and Dearness Relief for the existing and retired employees of Central Government. All India Consumer Price Index Numbers for the month of Sep, 2016 released. The Consumer Price Index for Industrial Workers Base Year 2001=100 for the month of September 2016 has been released by the Labour Bureau today through its official web portal. The index decreased by one point and stands at 277. The All-India CPI-IW for August, 2016 decreased by 2 points and pegged at 278 (two hundred and seventy eight). On 1-month percentage change, it decreased by (-) 0.71 per cent between July, 2016 and August, 2016 when compared with the increase of (+) 0.38 per cent between the same two months a year ago.